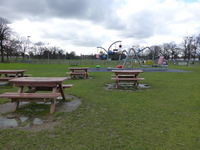 Services / facilities within the grounds include rugby pitches, football pitches, cricket pitches, changing pavilion, a cafe, playground, outdoor gym, gardens and a refreshment kiosk. The park is generally opened from 8am until dusk. . 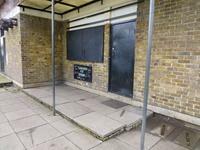 The toilet block has reduced opening hours due to anti-social activity. 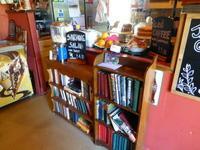 They are generally open from at least 9:00 - 15:00. The cafe and refreshment kiosk opening hours also vary accoring to the season and weather. Both facilities are open every day of the week. The team changing pavilion is open at weekends or when matches are playing. 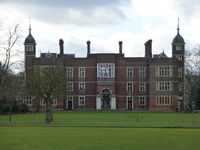 The pavilion was closed for refurbishment at the time of our survey (February 2015). The nearest National Rail station is Charlton. 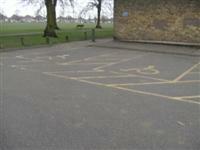 The dimensions of the designated parking bay(s) are 440cm x 560cm (14ft 5in x 18ft 4in). The nearest designated bay is 20m (21yd 2ft) from the access point into the park at the end of the car park. The furthest designated bay is 30m (32yd 2ft) from the access point into the park at the end of the car park. 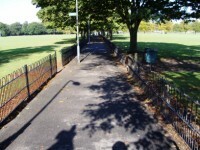 This car park is located at the eastern end of the park, off Charlton Park Lane. 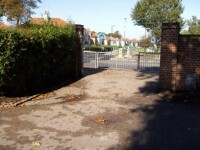 It is close to a school and hospital and is often full on weekdays. 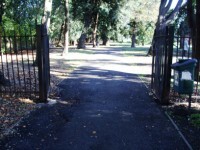 There is direct access from the car park onto footpaths into the park. 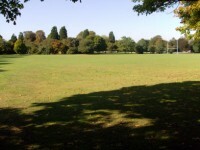 The car park is located near to the changing pavilion and playground. 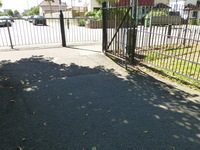 There is a public car park off Torrance Close, which is off Charlton Park Road. 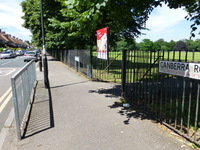 There is also some on-street parking in Cemetery Lane, Canberra Road and Charlton Park Lane. 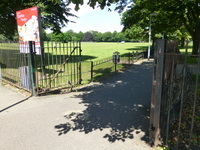 You are on Outside Access (Charlton Park Road Entrance). Skip to the next section. This information is for the entrance located on Charlton Park Road, opposite Charlton Lane. 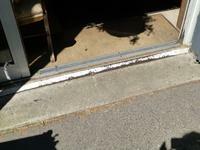 The door opening is 350cm (11ft 6in) wide. You are on Level Change (Charlton Park Road Entrance). Skip to the next section. You are on Outside Access (Canberra Road Entrance). Skip to the next section. This information is for the entrance located on Canberra Road. You are on Level Change (Canberra Road Entrance). Skip to the next section. 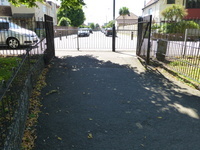 You are on Outside Access (Cemetery Lane Entrance). Skip to the next section. This information is for the entrance located on Cemetery Lane. 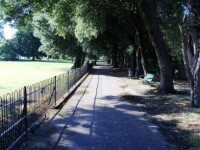 There are wide, easy to moderate tarmac paths throughout the park. 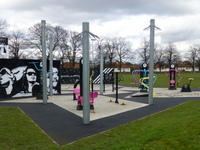 Near the Charlton Park Road entrance is an area with outdoor gym equipment and two table tennis tables. You are on Playground. Skip to the next section. 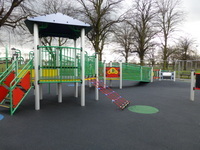 There is an enclosed playground at the eastern end of the park, near the car park. There are heavy outwards opening gates 130cm wide. 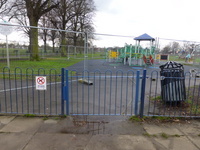 The playground is generally level with some uneven areas. 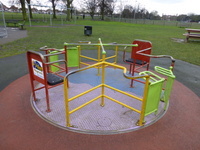 Play equipment which might be suitable for disabled children includes a level access roundabout. There are benches and picnic benches in the playground. Most are located on grassed areas. 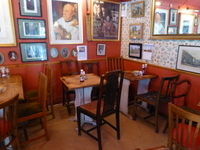 You are on Restaurant Bar Internal (Old Cottage Coffee Shop). Skip to the next section. 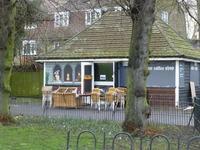 The café is located close to the Charlton Park Road entrance and the toilet block. There is level access with a small raised threshold at the entrance. The double doors are held open. In fine weather, there is additional seating with arm rests outside the venue. 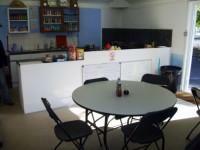 There is also a refreshments kiosk at the changing pavilion next to the playground (picture 5). There is a medium unmarked step up to the kiosk. Opening times vary according to the season and weather. You are on Outside Access (Toilet Block Entrances). Skip to the next section. This information is for the entrance located at the male and female toilets. 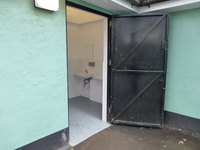 This accessible toilet is approximately 20m (21yd 2ft) from the Charlton Park Road entrance. 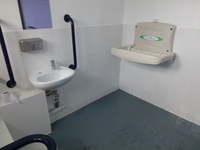 This accessible toilet is located within the female toilet block. This is a female facility. 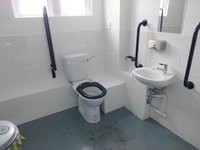 The dimensions of the accessible toilet are 225cm x 250cm (7ft 5in x 8ft 2in). 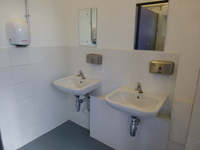 Baby change facilities are located in the male and female accessible toilet cubicles. 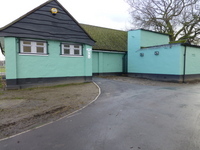 The female and male toilet facilities that were surveyed are located in the toilet block near the Charlton Park Road entrance. 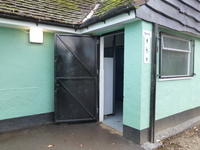 The female and male toilets are 20m (21yd 2ft) from the Charlton Park Road entrance. You are on Level Change (Approach to Toilet Block). Skip to the next section. 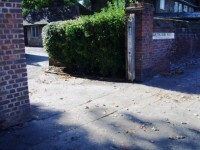 The ramp/slope is located from the Charlton Park Road entrance towards the toilet block. 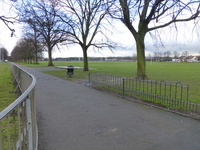 The assistance dog toilet area is located on grassed areas, away from pitches and the playground. Water for dogs can be provided when the cafe is open.